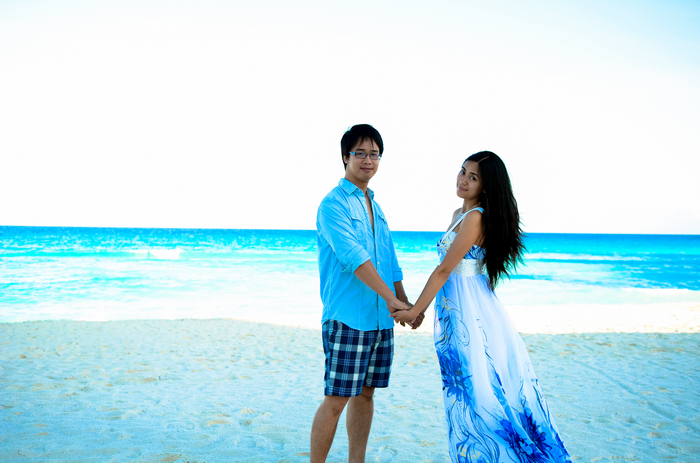 Today was the worst weather we had in our whole week vacation in Cancun, it was raining – heavy rain. But the good news was that it only lasted the first half of the morning. 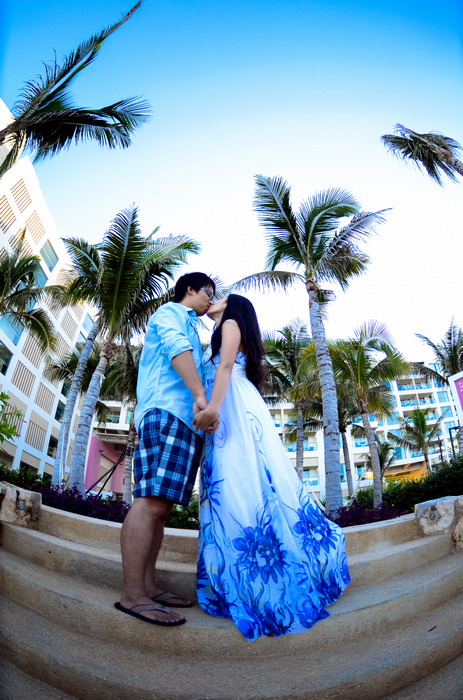 I planned to navigate to downtown in the early morning and then come back in the early afternoon so we will have enough time to get ready for our 5pm couples photoshoot that I booked through photosincancun.com. The rain totally messed up my plan. We stayed in our room and had our breakfast and waited….. I was so worried about the weather that I contacted Derek (our photographer) and he said he’ll reschedule if it is still raining by 4pm. The rain stopped at around 11:30 am and the sun was finally out! 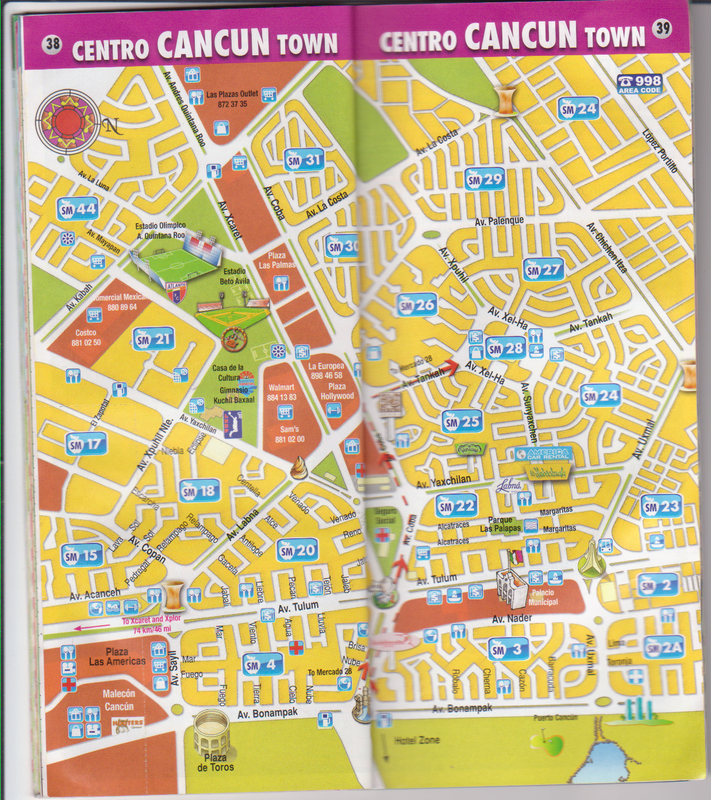 We continued with our plan to navigate to downtown to the famous souvenir market known as Mercado 28 “Market 28”. 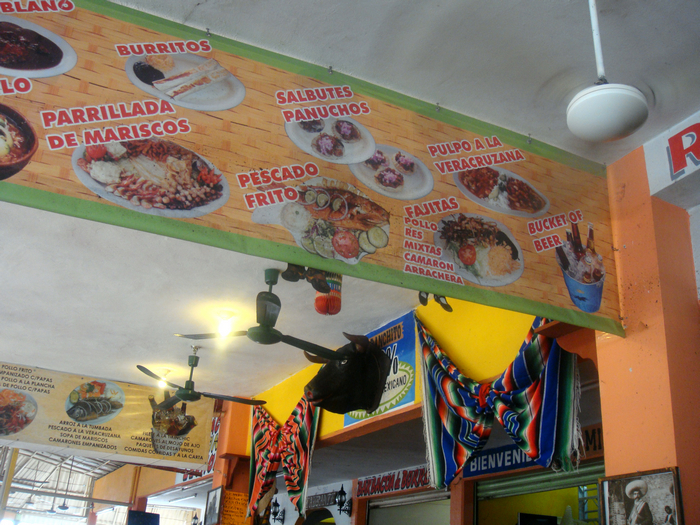 When I saw the small entrance to Mercado 28, I thought it was just few souvenir shops around that block. As we walked in the narrow entrance hallway, there were shops on each side like 10 shops but then what we didn’t realized was after the hallway, there were literally hundreds of shops inside!!! It was outdoor similar to Premium Outlets in the US but much smaller stores and packed together! Once we were “inside” and since many stores sell similar items such as silver jewelries and seashell-stone masks, it was like in a maze. Be prepared bargain and if you don’t like bargain, I recommend you don’t come here, just do your souvenir shopping at the malls. The prices are marked up outrageously! You really need to have an idea the worth of the item to bargain or else expected to pay high prices. So I recommend to check out the price inside the mall because they have fixed price to get an idea. Of course, you want to bargain to the price less than the mall! The owners in Mercado 28 will not sell you the price you really want and they could be really mean! If you don’t like the price, just walk away, and I am sure you’ll find similar items shortly in another store. Similar to the owner’s mentality, if they don’t sell you this item cheap, they’ll find someone who’ll buy it at the price they want as well! After going through store by store, we somehow ended up in the “center” of this maze which was an outdoor food court. There were a few budget restaurants in this food court and each restaurant had a waiter recruiting customer haha. We picked one with the most customers. They do have English menu and the waiters’ English were adequate. We ordered some fajitas and rice plate which were okay for the price. After lunch, we continued our way through the stores in Mercado 28, we had no idea how many stores to go and sometimes we ended up back in the same place! We left Mercado 28 at 2pm since we had to prepared for our photoshoot at 5pm! We got back to our hotel before 3pm and it was clear sky, no more rain!!! Right after we finished our 2 hours photo session, we went back to our room to change and then came back down to the hotel lobby to paid Derek and Lorena. Derek was able to burn us a CD for all the photos – more than 400 photos in 2 hours! Derek told us to take our time to review them and pick out 30 which he’ll do some edits! We went back to our room and put the CD in a safe place; we didn’t want to risk to lose it! Then headed back out for dinner. 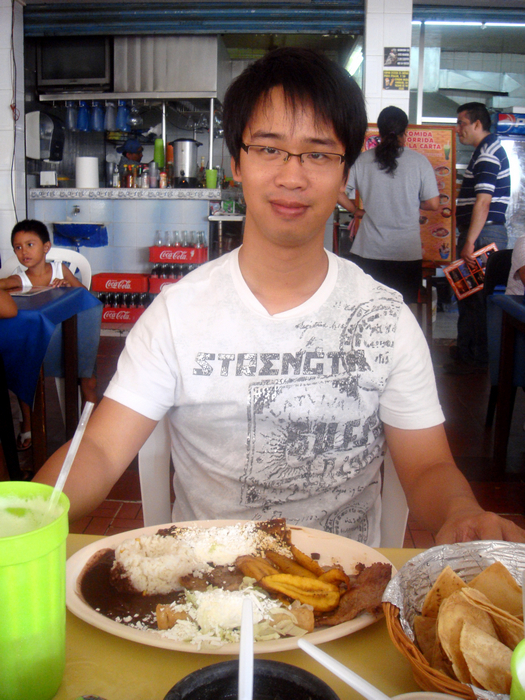 I planned to go to Fred’s House – Seafood Market and Grill. We got on a bus heading to the opposite direction from downtown, I pointed to the driver that we wanted to get off near this restaurant and he looked like he understand haha. And in a few minutes, the bus stopped right near the restaurant!! We didn’t made a reservation so we had to wait for a bit, not that long. The waiter walked us to our table and we passed by a “seafood market” full of various seafood! 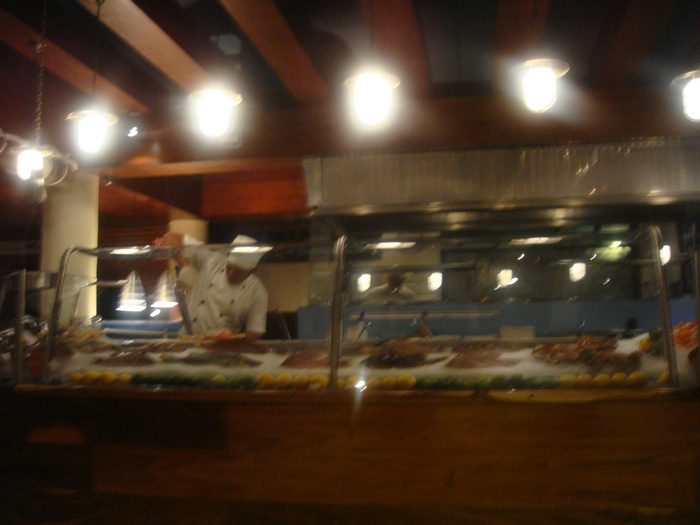 The restaurant was very clean and “ship” themed decor, not as nice as the one we went last night but the food was excellent! When we were seated, the waiter bought a stand over..I was wondering what was that for. Soon enough, the waiter bought a huge plate of seafood and some guy who looked like a manager came over and introduce the seafood platter! 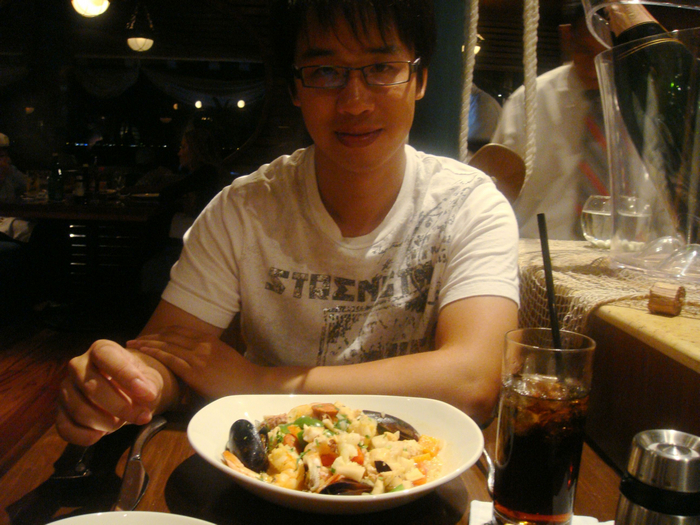 It was a lot of seafood but we decided to order by dishes. We ordered our food and the bread came. Love the bread they made as well as the dipping! 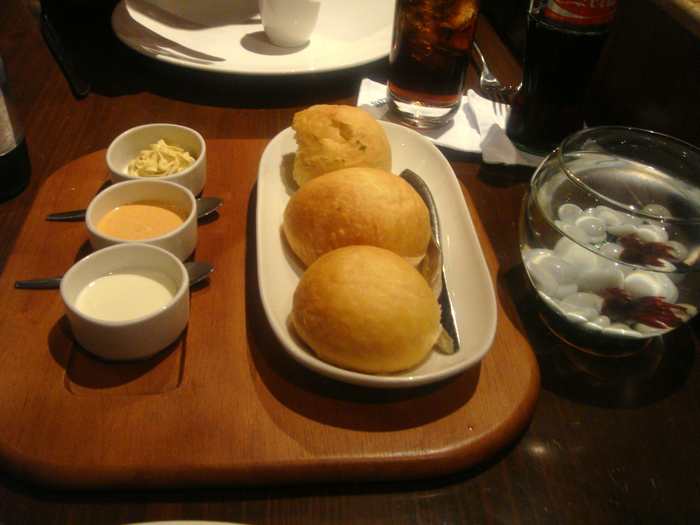 The bread was very soft and smelled very creamy and the sauce were delicious. We liked the one that tasted like butter with a little bit peanut taste. 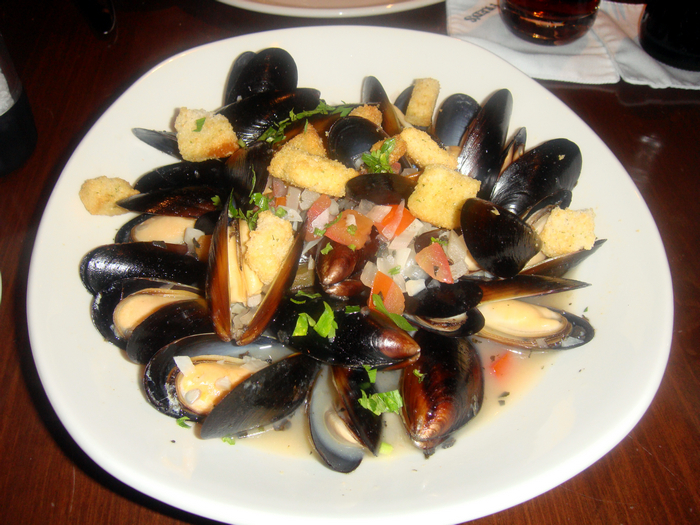 We appetizer came – mussels in white wine sauce. It was a big bowl full of mussels and it only costed 145 pesos ~ $10 USD!!! Hubby said they were the best he had so far! Even though I can’t take any alcohol, I tried out one on the top with the least wine sauce and it was yummy! They were very fresh and big! Main course, hubby ordered the seafood pot for 245 pesos around $17.50 USD which was pretty good in both price and quality! 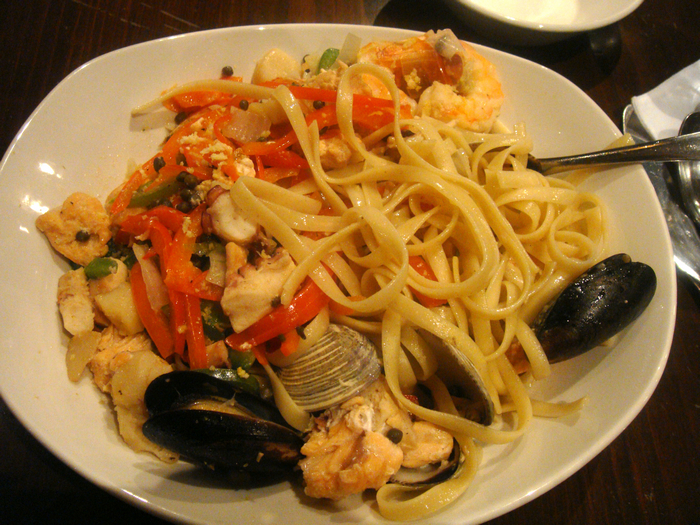 I ordered the seafood fettuccine for 240 pesos around $17 USD, a lot of seafood! It was good but not the best I had (#1 still the one I had in Santorini)! We had a great dinner at Fred’s House! And lastly we were full so didn’t order any dessert but the restaurant gave us a surprise! 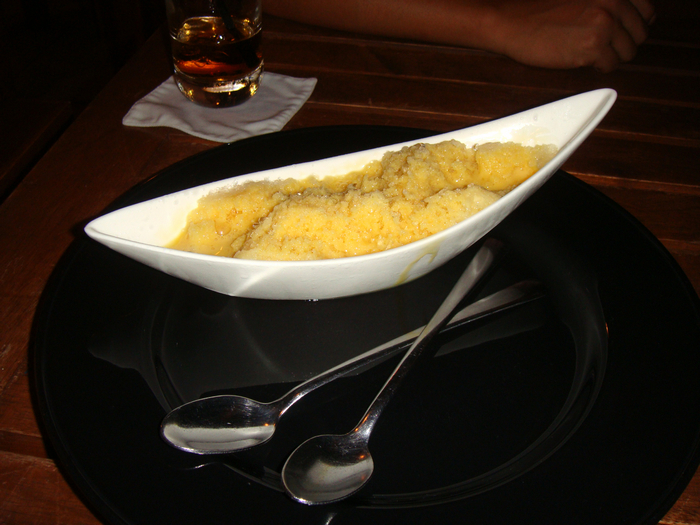 The waiter bought cover a canoe-like bowl with shaved ice and then he poured some orange colored cream over it. It was orange-mango taste, very refreshing!!!! We were very pleased with the restaurant’s service and food quality!!!! After our wonderful dinner, we walked across the street and walked to the nearest bus stop (there were bus stop signs). We waited for a few minutes and the bus came, we just got in the bus regardless of route because they all headed to the La Isla Mall direction which is our hotel. We got off in front of our hotel and headed back to our room to enjoy our wonderful photos! It was a fun and relax day despite the morning rain!